I have told you that it has been crazy busy for me lately, and I have said this is why I have been less attentive to Frequently Interrupted. That is not entirely true. More accurately, that is entirely true, but it is not the entire truth. My schedule did go off the rails, and I had to do some hard paddling just to keep from drowning. Some serious adjustments were made in order to get everything to fit, and this did cause some significant interference in my writing schedule. I’m fairly certain, though, that I could have made a few more adjustments a bit earlier in the process to prevent things here from being quite so suspended, or at least for quite so long. The truth of the matter is that I have been hiding. While I was aiming all of that effort at coping with changes in the office, I have not been coping so well with things outside of the office, and I have chosen to say nothing rather than risk saying the wrong things. Even here, today, I will probably not say as much as I might like, because it is a very difficult tightrope walk, over a pit of razors, with a biting crossdraft, and no safety net. It is not a very fun place to be, but no one ever promised that life would be fun, did they? We do what we can, we do what we must, and we make our own fun in between. First of all, some people may not know or realize this, but there is not a day goes by that I don’t consider the question, “Would they be better off without me?” at least once. At this stage in my life, I am happy to report that most of the time it is merely a passing question. It comes and it goes and it has no great impact on my life. It’s always there, but no more than a faint itch, a minor nuisance. It is simply part of the background noise that I have learned to ignore as I go on about my day. There was a time, though, when this question was the driving force of my life. It was a repeat performer, many times a day, and it often came in with a megaphone. Sometimes tap shoes. Just occasionally, it brought dynamite. Would they be better off without me? Can I ever get this right? Is it worth the effort? Am I worth the effort? Can I find a place in this world? There are some of you reading this who are all too familiar with those questions. If you battle with depression and suicide, you know the litany. Most of it is in your head - I hope you know that too - but that doesn’t make it less dangerous. “Of course it is happening inside your head, Harry, but why on earth should that mean that it is not real?” (J.K. Rowling, Dumbledore, Harry Potter and the Deathly Hallows). Inside our head can be where we do the most damage, if we are not careful, but there is plenty of damage to be done outside as well. When you struggle with these issues, it is just that much easier for outside concerns to push you over the edge. There is an abundance of pain in the world right now. There has never been a shortage of pain, but history moves in cycles, and there are cycles when that pain is closer to the surface and making itself more clearly know. It seems that we are in one of those cycles right now, and many people are reacting poorly to the pain and making things worse. Some people are intending to make things worse. That is not a very pleasant thought, and one we would prefer to not think, but it is real, and we cannot make the world better by closing our eyes to things that are real. There are people who revel in the pain of others. There are people who don’t believe that the pain of others is valid, or that it doesn’t matter. There are people who will gladly (or at least without difficulty) inflict pain because they believe that it promotes some interest of their own. We could do entire books on these people, and probably without making a dent, so we won’t go into great detail here. They are real, and we must acknowledge that they are real if we are to have any chance of counteracting their unpleasant impact on the world. Quite a few of the people spreading the pain, though, aren’t doing it on purpose. Some of them accidentally fall into that last category mentioned above, of believing that what they are doing is promoting an interest of their own, but they are often people who would be horrified if they actually saw the pain they were causing. They are sometimes people who have been conned by the more deliberate types, or perhaps have not been able to think things all the way through, or possibly have just never learned how to see the larger picture. This is neither a sin nor a crime. Many of us live in our one little place in the world, never straying far from the familiar, doing more good than harm, but never having a reason to go or see beyond the immediate village, so to speak. Unfortunately, in the modern world, even the village has wifi and social media, and suddenly what wasn’t harmful on a small scale can become harmful on a bigger stage we did not even realize we were upon. People are afraid, and there is reason to be afraid. It’s a dangerous world, and it seems to be getting more dangerous every day. We don’t make it less dangerous, though, by retreating into tribalism, by exaggerating and exasperating the Us vs. Them mentality. We live on a fragile blue dot, and, like it or not, believe it or not, today, we have the power to destroy that blue dot. If we don’t learn how to be just Us, the consequences could be dire, indeed. There is very little that I, as an individual, can do about deliberate evil, and yes, I do count those who are going around inflicting pain on purpose as evil. The deliberate infliction of unnecessary pain is one of the few things I recognize as truly evil in this world, and there is far more of it today than I am comfortable admitting. Evil is thick upon the earth, and it is very loud. It was that volume, more than anything else, that caused me to go into hiding. I was feeling overwhelmed, and there was no place I could look in the world around me without seeing it, so I retreated from looking at the world around me. There seemed to be nothing I could do, so I chose to do nothing. Remember that stage we set back at the beginning? The voices that have always told me I wasn’t good enough had found a new way in. That is the truth of the matter. I had gone back to the question of my having a place in this world being a daily, driving force in my life, and it had happened in so insidious a manner that I hadn’t even realized it. Well, here is the answer. I do have a place in this world, and part of that place is to remind people that we can be better. We can do better. We can stand up to evil without being evil. We can fight evil, when necessary, without being evil. There may be little I can do, as an individual, about deliberate evil, but I had forgotten that deliberate evil is the minority. Just as most of the good in this world is done by small, every day deeds, so too are most of the evils of the world done. The Hitlers and the Mao Tse Tungs are large evil, and they are fought in large ways on a large stage, but I can fight small evils by being kind. I can fight small evils by treating people as individuals, and remembering that they are people, with real thoughts, feelings, and concerns, just as I have. I can fight small evils by reacting less, and thinking things through before I do them, before I say them, and before I respond. My actions are as a stone upon the water, and I can see the ripples, I can see the results. If the results are not as I intended then I can change, and if I don’t change then I am responsible for the small evils that pile up and lead to worse. The larger evils cannot so easily gain traction in the world if the smaller evils are not paving the way. 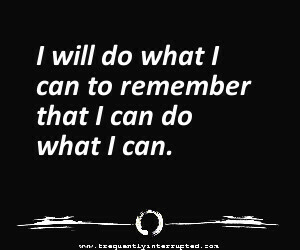 I will do what I can to remember that I can do what I can. I hope you will join me. I hope that you will think about your actions and ask yourself if they are being truly helpful or harmful. Are you letting fear cloud your judgment? Are you being more hurtful than is necessary to achieve your purpose? Are you adding more peace or more conflict to the world around you, and to the world at large? These are all things we need to consider, and no one is perfect, but no one needs to be perfect to make the world a better place. We just need to be willing and able to consider and adjust as needed. I will try to do better. In the end, that is the best that any of us can do.